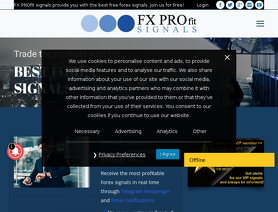 Before starting, I would like to state, that I am in no way affiliated with fxprofitsignals (or any other service provider) and have no connections to them except as a user of their proffered services. Would I call them thieves, outright scammers or their venture or signals a scam? I would not. Would I call them squeaky clean and transparent and above board and exemplary businessmen? I would not. These were there and I was aware of what I was getting into, but their figures seemed impressive, so I thought it was worth the risk. The first warning sign was the lack of transparency. Nowhere in their information could I find a name or a phone number of the real person (or persons) behind this. This led me assume that either, there were people who had messed up before in the fx scene and could not to associate their names with this venture, or there was some conflict of interest involved in revealing their names. Either way, normally I would not have gone with such a provider. Sign 2: Also lack of transparency: in their server IP address lookup and registration results, names are again hidden by a "service provider". They have taken an extra step to remain hidden. Sign 3: The company is registered in Bulgaria under Pro Forex LTD. The fact that there are advertisements all over the Net for company registrations in Bulgaria for ridiculously low Euro amounts, didn't fill me with that much confidence. Now to the crunch of the review. In the month or so of reviewing the signals my experience was that the signals were all over the place. They give 5 to 7 signals. I had days when all 7 hit stop loss... this is a very difficult achievement as even if you are blindly guessing, you'd get a better ratio. To be fair, there were days in which all hit at least TP1 as well. All in all, it was about a 10% loss of equity for me. Others may have had a different outcome. You get more analysis of the signals on the free channel than on the VIP channel. Meaning that while the free channel provides you diagrams / charts showing the analyses of the signals, you only get a (usually) burst of seven signals daily on the VIP with the occasion spam thrown in, though compared to the free channel, the spam is minimal. Forex sites are full of the dangers of depending on sites that report on the basis of pips but I am not going to repeat them here. This service, on it's free channel, brags about the "pips they made" in the previous day / week or month... provided they had it good. I found them unusually silent about their losses. While other services offer signal monitoring and "get out now" advice when markets move massively against you, you get none of that here. The pip calculations are also far from being absolutely right. For one thing, even when the signal arrives on Telegram, I have found the price has moved (usually around 3) pips. So the actual figure was different from their total right on that point. Also there are other obvious factors which made the actual pips gained/lost different to what they incessantly post on their free channel. So all in all a lot of hype. Do I think they are a scam? No. Would I extend my signals once they expire? No. Would I recommend that others buy their signals? No.